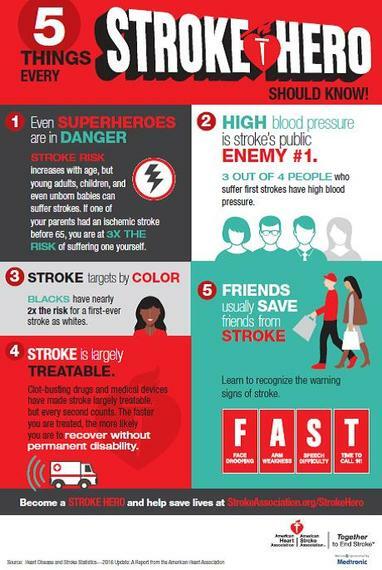 Most Strokes Preventable: Be Informed, Knowledge is Power! May is National Stroke Awareness Month. However, awareness about risk factors and preventions of stroke should be yearlong. One messages doctors have for our patients is the importance of knowledge. The fact is 80% of strokes are preventable. It's vital that patients learn the risks, know the signs and take an active role in prevention. Knowledge is power. Patients need to know that 80% of strokes are preventable. Blood pressure matters: High blood pressure is the biggest risk factor for stroke, with 3 out of 4 people who have a first stroke also having high blood pressure. However, 1 in 3 women with high blood pressure doesn't know she has it. Preventing Stroke: Reduce Your Risk Factors! High Blood Pressure: High blood pressure is the number one cause of stroke. Control your blood pressure through health eating habits such as the DASH diet (a flexible and balanced eating plan that encourages vegetables, fruits, whole grains and limits foods high in saturated fats and sugar sweetened beverages). Physical activity, quitting smoking, controlling diabetes, losing weight and medications as prescribed by your doctor are also important for reducing blood pressure. Learn more about how to lower your blood pressure from the National Institute for Health's Guide to Lowering Blood Pressure. High Cholesterol: High cholesterol can cause blockage of blood vessels in the brain, leading to a stroke. Your total cholesterol level should be under 200. Reduce your cholesterol level through Therapeutic Lifestyle Changes (TLC), which includes a healthy diet, physical activity, and weight management. Quitting smoking and medications managed by your doctor can also help to lower your cholesterol. Learn more about how to reduce your cholesterol here. Diabetes: Diabetics have four times the risk of stroke, compared with non-diabetics. Control your diabetes through weight loss, exercise, healthy diet, and medications. Take the Diabetes Risk Test, and talk with your primary care doctor. Even small steps such as choosing healthy alternatives and being active 30 minutes a day can make a difference. Learn about Small Steps for Your Health at the American Diabetes Association. Irregular Heartbeat: Atrial fibrillation, a type of irregular heartbeat, can cause the formation of blood clots that travel to the brain and result in a stroke. Work with your doctor to have it treated appropriately. You can reduce your risk of complications associated with atrial fibrillation by getting regular physical activity, eating a heart-healthy diet low in saturated fats, trans fats and cholesterol, managing your blood pressure, quitting smoking, maintaining a healthy weight, and controlling your cholesterol level. Carotid Artery Stenosis: Narrowing of the carotid arteries in your neck can lead to ischemic strokes. Patients often have no symptoms or may have transient mini-strokes. Treatment of carotid disease can include medical management and surgery. However, the key is prevention. Similar to other risk factors for stroke, you can reduce your risk of carotid disease by quitting smoking, being physically active, maintaining a healthy weight, and eating a heart healthy diet. Be informed. Knowledge is power. Make a commitment to be empowered in your health!